Engraving located on Long Reef Headland. 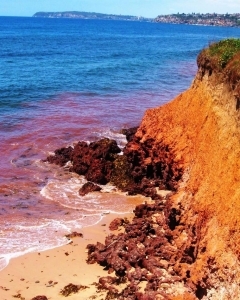 Background is Long Reef’s shale Redbed. I met with a local fisherman Bill Reilly of Aboriginal descent sitting on Long Reef Headland enjoying the ocean breeze. His stories were about fishing on the reef and in the coastal lagoons. He knows and respects his people’s strict laws – fish management practiced by his ancestors. Bill believes his people have visited this coastal area for thousands of years – it was and always will be a significant place for them. It is a place of reflection, food and shelter but, there is little evidence remaining today. The eroding cliffs reveal fossils of prehistoric animals and plants which date back millions of years. I agreed to assist Bill in researching what evidence we could find that Indigenous people once inhabited this area. A wildlife corridor existed before European settlement, running from Dee Why Lagoon, across Long Reef’s rock platform and around Collaroy Plateau escarpment to Narrabeen Lagoon. The area was rich in wildlife, marine and bird life. Migratory shorebirds fly in from the Arctic and New Zealand each year to feed on marine life. They had been regular visitors for possibly thousands of years. We are informed Aboriginal coastal clans –original inhabitants of the area, the “Saltwater People” camped on the western shore of Narrabeen Lagoon. They hunted freely along this wildlife corridor up until 1814 when the NSW Government issued free land grants to white settlers to farm the area. Continued development in the area has reduced known pre-European archaeological sites around this corridor to only a few shell middens and rock – shelters, the only evidence Aboriginal people once inhabited the area. The identity of the local clan is uncertain as many tribes across Sydney visited Long Reef to fish and trade. Warringah Council acknowledges the Guringai as the original owners of this area. Prof. Dennis Foley writes, “The clans hunting on Long Reef were originally the local Gai-mariagal people who camped on the west side of Narrabeen Lagoon. Their sister clan were the Guringai (or Kuringgai) their nabours to the north and at Manly lived the Cannaigal clan. The Darug clan lived to the west “. 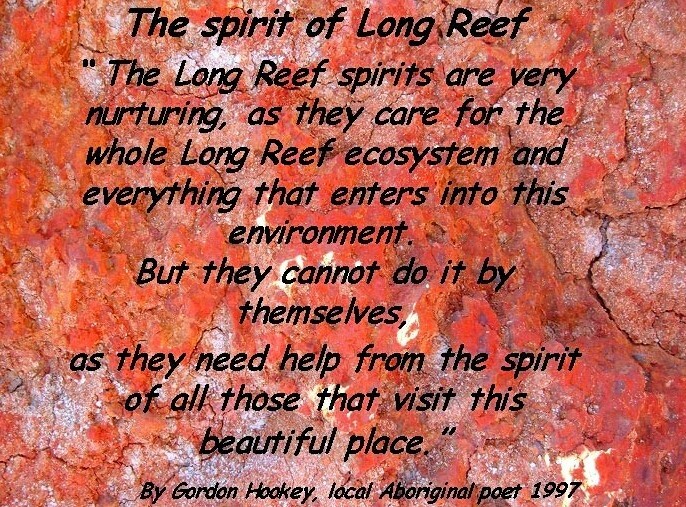 Written by Prof. Dennis Foley Aboriginal elder and author of ‘Repossession of our spirit’. He also writes European settlement in the area destroyed the traditional culture of the Aboriginal people. They were forced off their land when they lost access to their traditional hunting and food collecting areas. Resistance to what they saw as the theft of their land led to conflict and retaliation from European settlers. Introduced diseases also heavily impacted on the indigenous inhabitants. 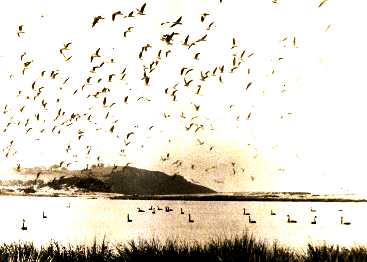 1920’s photo Dee Why Lagoon – teaming with bird life. Note in the background -below the headland massive sand dunes. We have found caves and rock-shelters around the Collaroy escarpment looking out over Long Reef. 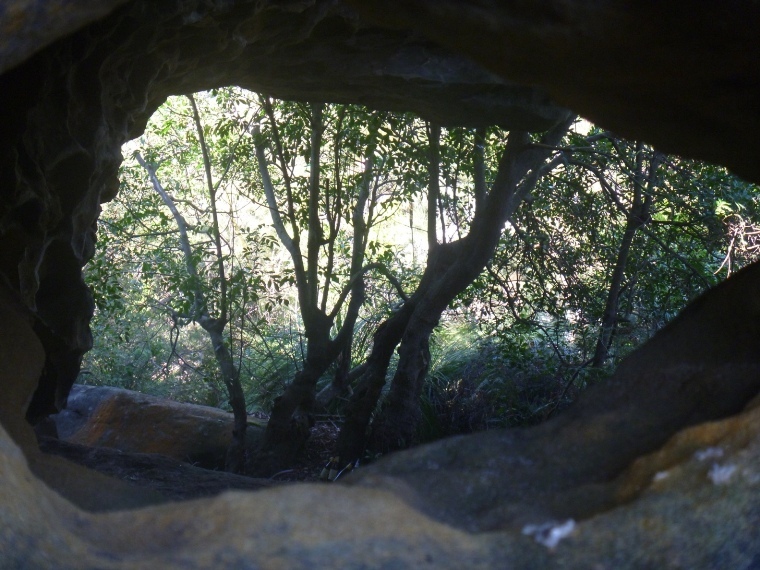 Professor Foley writes – walking tracks existed from Narrabeen Lagoon around to these caves. One was a teaching place for women’s business and a rock engraving once existed nearby. The engraving was of a large decorated shield similar to those seen on sites across the northern beaches. Note: It is aboriginal belief that all caves or rock shelters are a shelter for the spirits of their people. Several hundred engraving sites are known to exist along Sydney’s Northern Beaches, engraved on sandstone outcrops. They are mainly on flat exposed areas of Hawkesbury sandstone overlooking the ocean or coast. The engraving style is unique, and are of large figures drawn with a single outline. 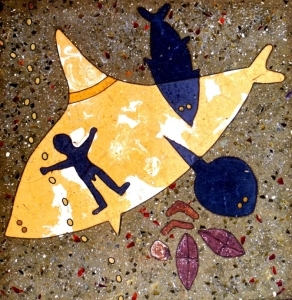 Others are of fish, whales, shields, kangaroos, cultural figures and footprints. It is thought the engravings were made by first drawing the outline of a figure with charcoal. A hard pointed stone was then used to pick a series of small holes along this outline. Art has always been an essential element of Aboriginal life. Red and white Ochre used for ceremonial events we believe was collected from Long Reef’s headland cliffs. Deposits of Ochre can still be seen there today. The Coastal people collected the Ochre, packaged it in Abalone shells and traded it to visiting inland tribes for hardwood. Hardwood was needed to make spears and other weapons. Left: Commemorative Plaque, Dee Why Beach. 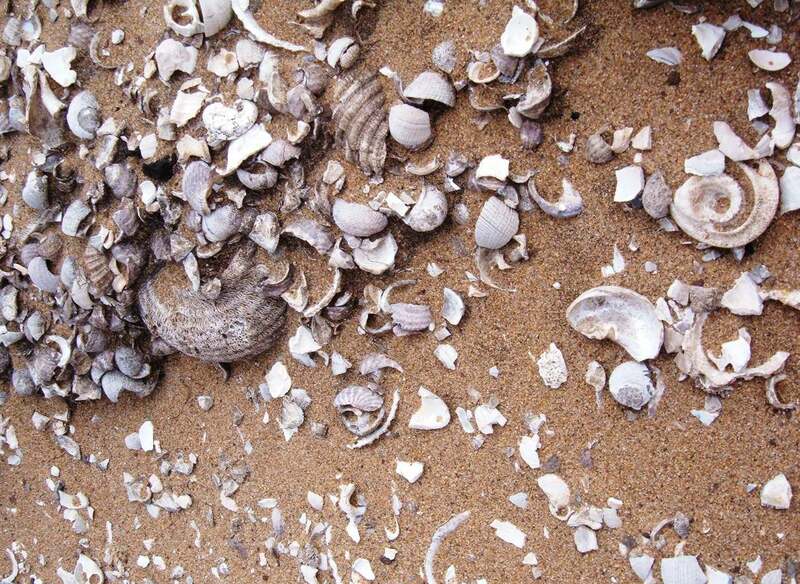 There were many Shell Middens extended along the northern beaches from Sydney Harbour, north to Pittwater. Marine life was plentiful especially around Long Reef’s intertidal rock platform. Indigenous men and women would dive for shellfish at low tide and Middens are shell mounds built up over hundreds of years as a result of countless meals of shellfish eaten there. 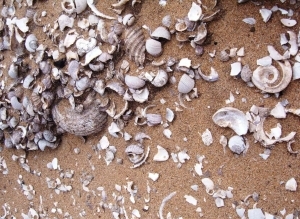 On the north – eastern side of Long Reef are the remains of weathered and burnt shells, probably food refuge left by the Aborigines. The area is highly eroded due to wave action over many thousands of years which has shifted the shells into layers, mixed with non-edible small shellfish. On the southern side of the headland Prof. Dennis Foley writes, is an area regarded by Aboriginals as a sacred place –an important woman’s place. Human remains were found in the late 1960s – the skeleton of an Aboriginal women but were removed by anthropologists. Also gone are the towering sand dunes that existed behind the Beach, see photo previous page, which were rich in flora and fauna including a little penguin nesting colony. The sand dunes were dug up and trucked away during the Second World War. Note: Both these sites are regarded as Midden sites and respected as sacred places. Aboriginal Heritage is now protected under the NSW National Parks and Wildlife Act. Warringah Council has strategies in place to protect these sites. Research revealed members of the Darug clan were not always welcomed by the local coastal people, the Gai-mariagal’s. During the war which erupted in the early 1700’s between the British and Aboriginal clans the Darug people did not support their brothers against the Government. Unfortunately this war resulted in most of the local clan perishing – survivers and their families moved north to joined their neighboring clan the Guringai. Differences have been reconciled; descendants, the local community and visitors now all enjoy Long Reef’s Aquatic Reserve and Wildlife Protected Area for what it has to offer. “Welcome to Long Reef –your presence is keeping the spirit live”. • Bill Reilly – The Darug Tribal Aboriginal Corporation. • Griffith Park Plan of Management, Warringah Council. • NSW National Parks & Wildlife. • Prof. Dennis Foley Aboriginal elder and author of ‘Repossession of our spirit’. His book is available from the Warringah Library. Modern day art based on the early sandstone engravings.